Michael Collins, a poet and scholar who appeared in Poetry Kanto 2007, has written a new book on Etheridge Knight, a major poet 2007, has written a new book on Etheridge Knight, a major poet for the most part off the radar screen of contemporary poetry readers. This new book by Collins, which has been well received, should help correct that situation. Below are details from the University of South Carolina Press website. 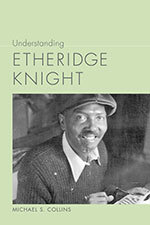 Understanding Etheridge Knight introduces readers to a major—but understudied—American poet. Etheridge Knight (1931–1991) survived a shrapnel wound suffered during military service in Korea, as well as a drug addiction that led to an eight-year prison sentence, to publish five volumes of poetry and a small cache of powerful prose. His status in the front ranks of American poets and thinkers on poetry was acknowledged in 1984, when he won the Shelley Memorial Award, which had previously gone, as an acknowledgement of “genius and need,” to E. E. Cummings, Gwendolyn Brooks, and W. S. Merwin. In this first book-length study of Knight and his complete body of work, Michael Collins examines the poetry of a complex literary figure who, following imprisonment, transformed his life to establish himself as a charismatic voice in American poetry and an accomplished teacher at institutions such as the University of Hartford, Lincoln University, and his own Free Peoples Poetry Workshops. Beginning with a concise biography of Knight, Collins explores Knight’s volumes of poetry including Poems from Prison, Black Voices from Prison, Born of a Woman, and The Essential Etheridge Knight. Understanding Etheridge Knight brings attention to a crucial era in African American and American poetry and to the literature of the incarcerated while reflecting on the life and work of an original voice in American poetry. Michael Collins is an associate professor of English at Texas A&M University. He has published essays and creative works in PMLA, Modern Philology, Michigan Quarterly Review, Callaloo, Parnassus: Poetry in Review, The Best American Poetry 2003, and elsewhere.